Nigeria, one of Africa’s largest economies, has been hit hard by falling oil prices and rising food, fuel and electricity costs, contributing to the country’s first recession in more than a decade. In addition, the terrorist group Boko Haram has displaced millions of people and disrupted agricultural activities – contributing to food shortages and famine in northern Nigeria. Faced with these circumstances, many Nigerians are concerned about the current economy and cite key development issues as very big problems for the country. The food supply, energy supply and a lack of clean drinking water are all growing concerns for Nigerians. And a plurality (27%) says improving the food supply should be the most important priority for the country. Nonetheless, Nigerians remain largely optimistic about the future of the economy. Religion is often a major demographic cleavage in Nigerian politics. Muslims are nearly three times as likely as Christians to say the economy is good. Christians, meanwhile, are more likely to think that the government is run for the benefit of a few groups of people, as opposed to 2015 when majorities of both groups felt that way. Both groups hold overwhelmingly negative views of Boko Haram; however, Muslims are much more likely than Christians to believe that the government is making progress against the terrorist group. Most Nigerians (79%) are dissatisfied with the way things are going in the country today, comparable to 2014, the last time the question was asked. Similarly, a majority of Nigerians (71%) describe the country’s current economic situation as bad, a reversal from 2015, when Nigeria saw its first peaceful democratic transition. In 2015, less than half (42%) felt the economic situation was bad. Despite the economy’s struggles and dissatisfaction with the way things are going, Nigerians continue to be optimistic about the future of the economy. A large majority (86%) reports that they expect the economic situation to improve in the next 12 months, similar to 2015, when 92% held the same view. Since 2013, the percentage of Nigerians expecting the economy to improve a lot has more than doubled, from 23% to 52%. Nigerians are more positive about their personal economic circumstances than those of the country overall. More than half (53%) describe their personal finances as very or somewhat good. Nigerians are also very optimistic about their personal economic future. More than nine-in-ten (93%) expect their personal finances to improve over the next year, up from roughly three-quarters (77%) in 2013, the last time the question was asked. The degree of optimism in particular has improved since 2013, when about four-in-ten (39%) said their personal economic situation would improve a lot, compared with 68% who say the same in 2016. Muslims and Christians diverge in their assessments of the economy and their personal finances. Nearly three times as many Muslims (43%) as Christians (15%) say the economy is good. Muslims are also more optimistic about the economy in the next year (58% improve a lot) than Christians (46%). And a majority of Muslims (62%) say that their personal economic situation is good, compared with just 43% of Christians. Nigerians with lower incomes are generally more positive and optimistic about the economy than those with higher incomes.2 Four-in-ten lower-income adults say that the economy is good, compared with just 23% of wealthier adults. Further, a majority of lower-income Nigerians (61%) expect the economy to improve a lot over the next year, compared with 47% of Nigerians with higher incomes. Nigerians also express a great deal of optimism about the future of the country for the next generation. More than three-quarters of Nigerians (78%) would recommend that a young person who wants a good life stay in Nigeria rather than move to another country (20%). The percentage saying that young people should stay in Nigeria is up 10 percentage points since 2014, the last time the question was asked. Poverty is the top issue for Nigerians, with 93% saying it is a very big problem. Energy shortages (e.g., blackouts or fuel scarcity), crime, government corruption and a lack of employment opportunities round out the top five concerns, with roughly nine-in-ten citing each as a very big problem. Lack of public participation in politics was the only issue not viewed as a very big problem by a majority of Nigerians. Compared with 2015, a larger share of the Nigerian public now sees the energy supply, food shortages and a lack of clean drinking water as very big problems (at least a 10-percentage-point increase). Notably, fewer today (43%) say a lack of citizen participation in politics is a major concern than said the same in 2015 (54%). Muslims and Christians are divided on the gravity of various issues facing Nigeria. The largest difference between these two groups is on the wealth gap, with 78% of Christians saying the gap between rich and poor is a very big problem, a full 13 points higher than among Muslims. A large majority of Nigerians (70%) believe that the gap between rich and poor has increased in the past five years. Just 15% say the gap has decreased and 13% think it has stayed the same. Although Christians and Muslims disagree about how significant a problem the wealth gap is, nearly equal percentages of Christians and Muslims believe the gap has increased in the past five years. This perception of a widening wealth gap comes at a time of heightened unemployment. The Nigerian government estimates that by March 2016, the unemployment rate was at approximately 12%, up from 8% a year prior. A majority of Nigerians (63%) say that a very important reason for unemployment in their country is that many jobs only go to people with connections. At least a third think that health issues (36%), schools not teaching the necessary skills (35%), discrimination because of ethnicity (35%) and laziness and apathy (33%) are also very important reasons for unemployment. Christians and Muslims generally agree on how important these factors are in driving unemployment, but Christians (69%) are more likely than Muslims (57%) to say that positions only going to people with connections is a very important reason many people do not have jobs. Few Nigerians blame globalization for job losses, with only 25% saying the nation’s involvement in the global economy is a bad thing because it costs jobs and lowers wages. Conversely, 70% believe Nigeria’s involvement in the global economy is a good thing because it provides the country with new markets and opportunities for growth. The terrorist group Boko Haram was a key issue in the 2015 presidential election and the eventual winner, Muhammadu Buhari, vowed to defeat the organization. Boko Haram has also been blamed for the food shortages facing parts of the country. Today, the vast majority of Nigerians (93%) hold an unfavorable view of the organization, up from 76% in 2015. These unfavorable views of Boko Haram are shared by Muslims (94%) and Christians (93%) alike. Roughly three-quarters of Nigerians (76%) think that the government is making progress in its campaign against Boko Haram, up from 61% in 2015. Just 10% believe the government is losing ground, compared with 19% who said the same in 2015. Today, at least eight-in-ten rural Nigerians (81%) and Muslims (91%) say progress is being made against Boko Haram, compared with 69% of urban Nigerians and 62% of Christians. Of the six development issues asked about, a plurality of Nigerians (27%) say that agriculture and the supply of food should be their country’s top priority. Roughly two-in-ten Nigerians say each of the following are the most important priority: the supply of energy, such as electricity or petrol (19%), education (18%) and government effectiveness, such as reducing corruption (17%). Fewer say health care (14%) or the country’s infrastructure, such as roads and bridges (5%), are the top priorities. Northern Nigerians in particular would like to see the food supply prioritized, with a plurality (33%) listing it as the most important issue. This contrasts with Nigerians in the south, 20% of whom say the food supply is the most important priority for improvement. Muslims, who are the majority in the north of the country, and Christians, who are concentrated in the south, similarly do not see eye to eye on the relative urgency of improving the food supply. Muslims (32%) are more likely than Christians (22%) to rate the food supply as the most important issue. Nigerians were also asked which of the six options should be the second most-important priority for the country. On this, Nigerians are divided across the issues of education (23%), agriculture and the food supply (21%), the energy supply (18%) and health care (18%). About one-tenth of Nigerians each name either government effectiveness (11%) or infrastructure (9%) as the second-highest priority. A majority of Nigerians are optimistic about the potential for improvement across key issues. More than eight-in-ten say health care (86%) and education (85%) will be better for the next generation. Approximately seven-in-ten say poverty (71%) and gender equality (70%) will be better, while smaller majorities report optimism on terrorism (61%) and government corruption (60%). 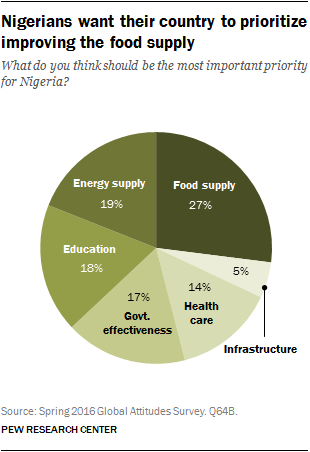 Nigerians are especially optimistic about health care and education. A majority believes education (62%) and health care (60%) will be much better for the next generation, while less than half have the same degree of hope for the other issues asked about. Women are more optimistic than men on most of the issues, including gender equality (75% better vs. 65%). Muslims and Christians differ on how positive they are about the future of terrorism (68% vs. 55%) and government corruption (68% vs. 53%) in Nigeria. Lower-income and higher-income Nigerians differ on their degree of optimism on several issues. Those with lower incomes are more likely than higher-income individuals to believe that education (70% vs. 58%), health care (67% vs. 57%) and government corruption (43% vs. 33%) will be much better for future generations. 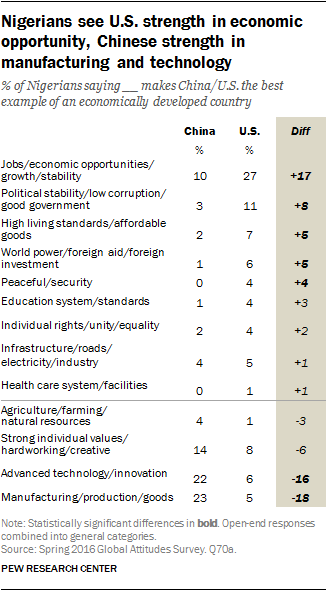 When asked to name which other country they think is the best example of an economically developed country, Nigerians tend to name either China (28%) or the United States (25%). The next most common answer is Saudi Arabia at 4%. Christians (33%) are more likely than Muslims (17%) to name the United States. Meanwhile, no Christians believe that Saudi Arabia is the best example, compared with 8% of Muslims. A majority of Nigerians (55%) continue to feel that the government only benefits a few groups of people, but that percentage is down from 61% in 2015, around the time that Buhari was elected. The percentage of Nigerians believing that the government is run for the benefit of all has increased from 36% in 2015 to 42% in 2016. Higher-income Nigerians (60%) are more likely than lower-income individuals (41%) to believe that the government is run for the benefit of a few groups. Supporters of former President Goodluck Jonathan’s People’s Democratic Party (67%) are much more likely than supporters of current President Muhammadu Buhari’s All Progressives Congress party (44%) say the government only benefits a minority of people. Similarly, Christians (65%) are much more likely than Muslims (45%) to take this position – a change from last year, when majorities of both Christians (58%) and Muslims (64%) felt this way. Still, 68% of the public thinks that ordinary Nigerians can do a lot to influence the government if they are willing to make the effort. Compared with those with lower incomes (61%), higher-income Nigerians (72%) are more confident that ordinary people have a say in politics. Despite disagreeing on whether government is run for the benefit of all or a few, roughly two-thirds of both Christians (67%) and Muslims (69%) believe that they can influence the government. The vast majority of Nigerians report having voted (85%) in either the last 12 months or the more distant past. Attending a political campaign event or speech (44%) and participating in a political, charitable or religious-based volunteer organization (40%) are the next most common forms of political participation. There are large differences in levels of political activity by gender. Across most activities, men are more active than women. 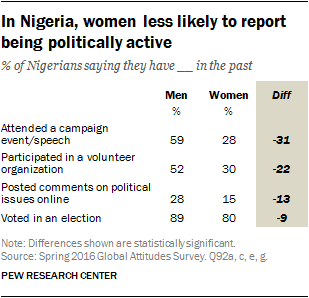 This is true for attending a political campaign event (59% men vs. 28% women), participating in a volunteer organization (52% vs. 30%), posting comments online (28% vs. 15%) and voting (89% vs. 80%). Nigerians with a secondary education or higher are more likely than those with less than a secondary education to have posted social or political comments online (25% vs. 8%) and encouraged others to take action online (24% vs. 8%). 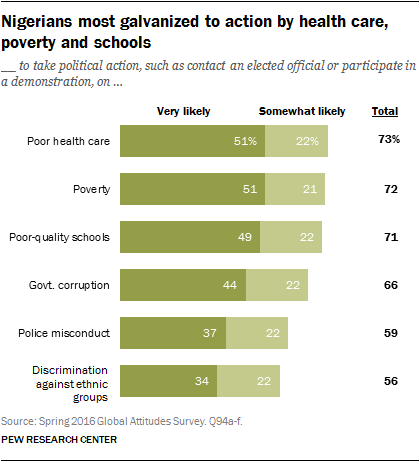 Roughly seven-in-ten Nigerians say they are personally likely to take political action on the issues of poor health care (73%), poverty (72%) and poor-quality schools (71%). Moreover, majorities are inclined to take action on government corruption (66%), police misconduct (59%) and discrimination against ethnic groups (56%). About half of Nigerians say they are very likely to take action on the issues of poor health care (51%), poverty (51%) and poor-quality schools (49%). Discrimination against ethnic groups is again the least galvanizing issue, with just 34% saying they are very likely to take action on it. On the issues of poor-quality schools (52% vs. 39%), government corruption (46% vs. 35%), poverty (53% vs. 43%) and police misconduct (39% vs. 30%), those with a secondary education or higher are more inclined to say they are very likely to take action.